In what is now the latest of chemical weapons attacks to have taken place inside Syria and blamed on the Syrian government by the Western media, the recent chlorine-based gas attack in Kfar Zeita has prompted the Anglo-European propaganda machine to once again begin greasing up its gears to accuse Bashar al-Assad of crimes against humanity and justify some form of humanitarian intervention in Syria by NATO forces. 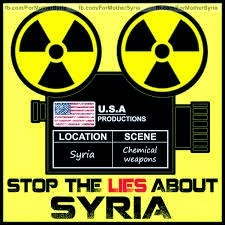 The attacks come shortly before the completion of the transfer and destruction of Syria’s chemical weapons stockpile. Predictably, the recent attacks are being promoted by Western outlets as an example of how a chemical weapons free Syria is still capable of deploying chemical weapons against civilians due to a loophole allowing for the production of chlorine gas.